Add a soft, weightless bounce to curls with this feather-light natural leave-in conditioner. Just a small amount of this silicone-free cream softens and moisturizes curly hair, making it silky smooth to the touch. Infused with 5 desert derived botanicals and coconut oil to strengthen hair and repair damage from environmental stressors and styling. I'm in love with this hair cream. Most other curl creams aim to enhance curls and you end up even curlier which is not my goal. This cream just defines and sculpts the curls you already have. It's perfect for what I'm looking for. I have coarse, curly hair and I LOVE this product for smoothing out the curls after I diffuse my hair dry. I also LOVE when it goes on sale on Well.ca, as it rarely goes on sale in my city. GREAT product for curly hair! This curl creme works in my very curly hair. My hair feels dry and gets frizzy in the winter, this product controls the frizz, smooths and helps define the curls. No residue, no crunchy or heavy feeling. The scent is nice, light, and my hair looks shiny, which is rare. Wish it came in a bigger bottle! In the winter I use this and another curl product, in the summer this is all I need. Love it! My hair is really dry and curly. This works really well for me and smells great. Great moisturizing product for curly hair. I love the coconut smell as well. I put it in my hair after shampoo and conditioner and just do a quick rinse to spread it through, leaving most of the product there. Defines my curls and provides shine and a nice scent. Wish it came in a bigger bottle. When I first tried I didn't think it did anything for my long curly hair. But I have since come to love it. The difference is I had to first repair my hair and get it healthy. It was very dependent on products which I didn't want. I put this on in the shower on top of a leave in conditioner. I only use about quarter size dollop for my whole hair and my hair is long and thick. I scrunch it in and it really defines my curls and holds them for a few days as I only wash my hair every 4 days. Love it. It doesn't make my hair sticky or crunchy either because I play with my hair a lot and hate to have product all over my hands. I really enjoy using this cream for my hair, it defines my curls while leaving it feeling natural and soft. I cannot believe how long this product has lasted! I have medium length curly hair. The previous curl creams I have used normally last for a quarter of the time this one has. I will be purchasing this product again. It does a great job leaving my hair soft and frizz free! It smells great as well. Great purchase! Great product. Definitely see better curl definition and it leaves my hair soft and touchable. Nice scent too. Will repurchase. Awesome hair cream! I had been using Bumble and Bumble hair cream for years, but I wanted to try something more natural. My curls turned out great and my hair looks just like hair - not greasy or weighed down. A little goes a long way! I prefer this over my expensive Bumble and Bumble cream that make my hair look like it was full of product at times. I bought this for my daughter as she has natural wave and curls in her hair that tends to be frizzy. This product totally smooths out the frizz, very satisfied. This was my first time buying this product, but it is awesome. I will definitely be buying it again. But you only need a little ;bit which is awesome, so it will last for a long time. This is an excellent leave-in for fine, curly hair. I've been using it for about a year and it's the best product I have found to help the frizz. Wanted to love it, as I love the shampoo and conditioner, but didn't. Smells great and is moisturizing but by the second day my curls fell flat and looked lifeless. Would not repurchase. Leaves soft, natural curls, without any chemicals. Smells heavenly, had to buy a second bottle for my teenage daughter! And did I mention it smells amazing? Love Desert Essence products. Gives my hair soft curls as the name states and smells delicious too! This product smells so good ! It also leaves your hair soft and smooth. It however doesn't give your hair "defined" curls with a lot of hold as using a mousse or gel would. I'm however enjoying this product and will probably buy it again. I really like this! I use it as an hybrid leave in conditioner/curl cream. It makes my hair very shiny and moisturized, and enhances my waves. Even though my mother has straight hair, she also enjoys this as it makes her hair very soft and manageable.I would repurchase this, or try out their shine and refine hair lotion to see if it's different. This product is fantastic, defines my curls and makes my hair have a ton of volume. Only downside is it doesn't provide any hold, so have to use it with a gel. The smell isn't too strong. It has some hold but isn't crunchy. At the end of the day I'm not sure my hair looks a whole lot different but my curls tend to hold on their own anyways. I do think this product reduces frizz and I love how the company is earth friendly. I use it out of the shower while my hair is still very wet and I think that is the best approach. Love this product, not sticky and you need very little! I love this product because it is cruelty free and that's very important to me. It also is a great product. It does wonders for my curly hair and the smell is wonderful. I love it. Leaves hair soft, manageable, and not sticky. Excellent product for my daughter's curly hair. After conditioning in the shower, I comb her hair then put some of this product on and let it air dry. It dries to perfect ringlets. I love the coconut smell - makes me feel like I'm on vacation! I LOVE this product! I have very curly hair and have spent so much money trying to find a product that will work well with my hair. This is great. My hair feels very moisturized and healthy. This is the only thing I put in my hair each morning. The doesn't make my hair crunchy or gross, it feels very soft. The smell is delicious, not too strong just lightly scented. Highly recommend trying! Leaves hair feeling hydrate and soft - nice delicate smell, not overbearing. 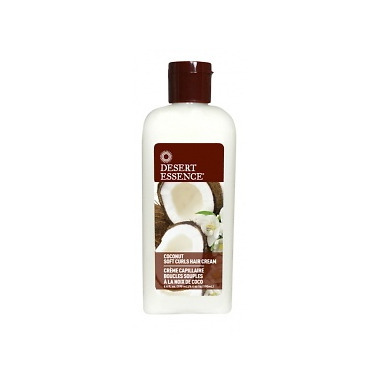 Wonderful coconut smell and works really well at detangling hair too!! !